The Cabinet Committee on Security (CCS) today rejected the US plea for sending Indian troops to Iraq after an intense debate which saw top ministers taking radically divergent stands on the thorny issue. Do you approve of legislation for constructing a temple at Ayodhya? Within 30 minutes of announcing his decision to resign at the end of a two-day open session of the Samata Party here today, Railway Minister Nitish Kumar tendered his resignation to the Prime Minister. Former RSS chief Rajendra Singh, popularly known as Rajju Bhaiyya, died here today following a prolonged illness. A bachelor, the 81-year-old former RSS chief is survived by his brother. The last rites would be performed here tomorrow. 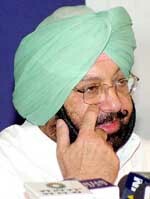 Asking BJP chief Venkaiah Naidu not to advise the Congress-ruled states on issues of governance, Punjab Chief Minister Capt Amarinder Singh today said that his government was in the process of unravelling “overseas assets” of SAD chief Parkash Singh Badal. What kind of politician is he? Nothing objectionable was found in the raids. Mr Jai Singh Gill, an IAS officer of the1968 batch, is to be the next Chief Secretary of Punjab. He is currently on deputation to the Central Government, as Secretary, Steel. The Shiromani Gurdwara Parbandhak Committee has decided to allot the prime land (Golden Avenue) worth crores, belonging to Darbar Sahib, to its employees at a throwaway price. After dithering for months, the Union Government today agreed to provide Rs 55 crore for the fourth phase of “Galiara Yojna” at the Golden Temple in Amritsar. The SGPC president, Mr Kirpal Singh Badungar, is likely to step down from his post tomorrow, highly-placed sources said today. The SGPC may publicly announce his decision at akhand path in Manji Sahib or soon after at a closed-door meeting of Akali leaders, including Mr Parkash Singh Badal and Mr Gurcharan Singh Tohra. The Centre is likely to announce a special lending rate structure for the farm sector this week which can mark the beginning of a declining interest rate regime for the credit-starved agri sector.